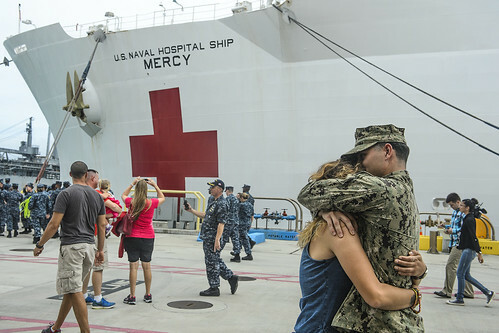 ASAN, Guam - Pacific Partnership 2015 personnel stationed in Guam, but recently assigned to the hospital ship USNS Mercy (T-AH 19), returned home Sept. 4 as the ship pulled in to U.S. Naval Base Guam for a liberty port call. While many other PP15 personnel will stay with Mercy until Hawaii or the ship’s homeport in San Diego, airmen from the 554th REDHORSE Squadron and Sailors from U.S. Naval Hospital, Guam have reached their final destination and were reunited with their families, friends and parent commands. Nine REDHORSE engineers from the squadron worked alongside U.S. Navy Seabees, Royal Australian Army engineers, Japanese Self Defense Force engineers, engineers from Malaysia and Timor-Leste, as well as engineers from the host nations of Fiji, Papua New Guinea, the Philippines and Vietnam, to build or renovate schools and hospitals. Eight Sailors from U.S. Naval Hospital, Guam returned home as well. “It’s been hard work, but it’s fulfilling to successfully help the patients we set out to help,” said Chief Hospital Corpsman Eric Lindain, a PP15 country site supervisor. Lindain had mixed feelings about returning home. “It will be nice to relax but it was a great journey. Lots of friendships and camaraderie,” he said.